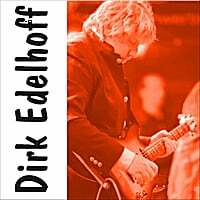 Dirk Edelholff can be confidently described as an old stager in the German rock, jazz, and blues music scene. He is after all one of the most technically well-versed and versatile guitar players in that area. On top of that he is also a bass player and drummer; he was born in 1963 and started playing the guitar at the age of 12. As Dirk recalls: “As far as I can remember I always wanted to be a musician.” That is why he was making a noise in the world with the guitar already during school years and won the German Nordrheinwestfalen state competition “Jugend jazzt” twice. After that it was clear to him that he really wanted to be a musician. * 2005 „John Lester“ USA (Pop/Jazz/Soul). Guitarist and multi-instrumentalist Dirk Edelhoff, has been teaching advanced guitar techniques in Germany for quite some time now. Outside of that teaching he’s competed and won in music festivals and continued to hone his craft, turning himself into an incredibly versatile musician. All those years of teaching and performance are channeled into his album, Different Colors. In nine tracks, Edelhoff is able to show just how stunning a guitarist he is, while simultaneously constructing an instrumental album that is as fun to listen to as it is technically impressive. The opening song to Edelhoff’s tour de force is “Irish Sea.” Immediately he captures a Celtic music tone with his textured guitar playing. The atmosphere is reinforced with a wonderful layering of instrumentation, richly and cleanly produced to where every snap of the snare drum, every thump of the bass, comes across vividly. Adding to the sound of this particular piece is an organ solo courtesy of Peter Gorges; while it’s not pivotal to the Irish elements of the song, it’s still well incorporated and adds another bit of excitement to the arrangement. “Blues Rock Train” is the following song and is more indicative of the type of sound that Edelhoff embraces on the album. It’s built off of a heavy blues/rock riff that relentlessly drives the song forward. The simple repetition of it makes it very familiar, which in turn gives the track a strong sense of continuity even in the most intense moments of the soloing. And the solos are indeed intense. Edelhoff plays with speed and precision, but also adds in some keyboards that rise up at key moments to further the energy of his playing. The best moment for Edelhoff in terms of his soloing is on the third song, “Indi 8string.” In a change-up, the piece starts off slowly with a heavily atmospheric keyboard arrangement. The drums indicate that something more powerful is going to come along and it certainly does after about a minute. Edelhoff unleashes a very hard sounding lead guitar that ultimately builds up into a frenetic display of guitar mastery. In-between these displays are some brief, more melodic stretches; but they don’t compare to the harder ones. There are songs though that are completely dedicated to bringing the energy down a few notches. “The Blue Suite” and “Remember” are both very laid back pieces, embracing a sort of new age jazz sound. The former is the stronger of the two and prominently features Edelhoff adopting a classical guitar sound. Though neither track is as compelling as the up-tempo numbers, they feature Edelhoff in a different capacity; showing the beauty of his craft as opposed to the fiery intensity he is capable of. In another genre-bending turn, Edelhoff turns his gaze on funk on the appropriately named, “Clockwork Funk.” The immediately arresting jangle of the guitar is a throwback to ‘70s funk groups like Average White Band. The keyboards function as a makeshift horn section, and the strong bass line echoes the funky tone of the lead guitar. As the song progresses into its second half, Edelhoff opens up and delivers a snarling solo; successfully mixing elements of funk and rock. Though these are the high points of Different Colors, the other tracks have more than enough redeeming elements to make them worthwhile listens. For example, “Just Blues” is a wonderfully done blues piece, restrained but compelling. “Classic Tapp” brings in a very strong bass performance and has stinging guitar lines resound from start to finish. And the calmer album closer, “Drei Viertel,” helps round out the album by ending on a peaceful vibe. There’s a lot to enjoy in the guitar playing of Dirk Edelhoff, his ability and talent is unquestionable, as is his versatility. By demonstrating his craft across multiple different musical styles, Edelhoff makes Different Colors an enjoyable album to listen to as a whole. He also displays his years of experience as a performer and teacher by making every note mean something to the song they’re played in. Music and guitar enthusiasts will be thrilled by this collection of consistently played gems, and even casual music fans will be able to appreciate the talent that has been poured into this record. "Blues Rock Train" Reviewed by RadioIndy.com!